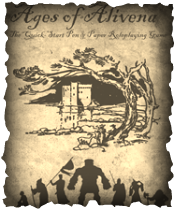 Ages of Alivena is the premier quick-start, easy to learn, pen and paper role-playing game. It is specifically tailored to make it easy for new players to get started, whether questing or GM-ing, while still providing enough depth for those who want to delve deep into the untold chapters of history from the vast ages of Alivena. This section of the site is dedicated to FREE DOWNLOADS, support materials, updates and expansions. THE BASICS - This is the FREE Ages of Alivena download! It gives you everything you need to start playing the game! What are you waiting for? CHARATER SHEETS - These are additional blank character sheets. These are included in 'THE BASICS' download above. UTILITY SHEETS - These are additional blank character utility charts. These are included in 'THE BASICS' download above.